01 copy, a photo by Chindits on Flickr. 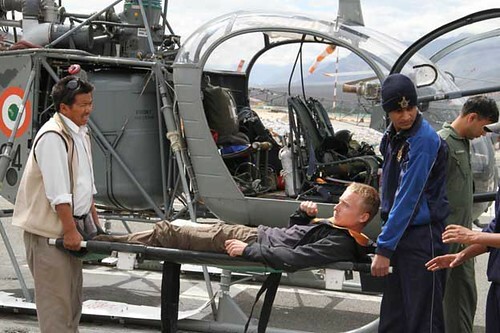 Pilots of Leh based Helicopter Unit evacuated two foreign nationals, Czech brothers, Mr Lucas and Mr Tomas Pfeifer from the higher reaches of Padam valley in Zanskar ranges of Ladakh region on 5th August when two members of the trekking team sustained injuries after a fall. Members of a Czech Republic trekking expedition, suffered injuries while crossing a river near Testha Village in Zanskar Valley. Mr Lucas Pfeifer was critically injured in a fall resulting in knee fracture and ligament tear, rendering him completely immobile; his brother Mr Tomas also sustained injuries while trying to support him during the fall. The injury, inclement weather, high altitude and their remote location combined forced the team to request for emergency air rescue through their embassy and Govt of J&K.